The dance "Kuronushi" is the fifth and last section of the five-role hengemono "Rokkasen Sugata no Irodori", which was staged in the 3rd lunar month of 1831 at the Nakamuraza. It starred Nakamura Shikan II in the five roles of Sôjô Henjô, Ariwara no Narihira, Bun'ya no Yasuhide, Kisen and Ôtomo no Kuronushi. His stage partner in the role of Ono no Komachi was Iwai Kumesaburô II. "Kuronushi" is performed with a Nagauta ensemble. The poetry contest first introduced in Henjô, the first section of Rokkasen, is now taking place, and the two most lauded poets of the age, Ono no Komachi and Ôtomo no Kuronushi, are battling it out. Kuronushi is a high-ranking courtier of noble lineage, but he is nevertheless a villain, and when Komachi's competition entry is read out he accuses her of plagiarism. Her poem, he says, is an ancient one, and is already in a famous anthology. In fact, Kuronushi has overheard Komachi giving a practice recitation of her poem the previous evening, and has himself written it into the poetry book in order that she - his only real rival - might be eliminated from the contest, making him the likely winner. Komachi is not a lady to take this sort of false accusation lying down. To Kuronushi's consternation, she suggests washing the relevant page of the anthology he has indicated. Although, of course, in Heian times all books would have been written by hand, ink took a very long time to fully dry, and it was probable that newly brushed writing would be erased with water, whereas much older and completely dry writing would remain. Kuronushi nevertheless stands his ground and tries to brazen it out. However, Komachi carries out her threat, and pours water onto the offending open page of the poetry book. The newly written poem duly vanishes as she predicted. Kuronushi is forced to admit his guilt, both in his attempt to shame Komachi, and also, as she suggests, in trying to place a curse on the Imperial House with his own poem. He is, he says, the legitimate heir to the ambitious minister Yakamochi's designs to usurp the realm. As he threatens to kill her, Komachi summons help, and a band of flower warriors (hana yoten) rushes to her assistance. After a tachimawari sequence, the play ends with a pose of Komachi clutching the poetry book, and Kuronushi brandishing his sword, as they pull away from each other. "Kuronushi" is a short 10-min long dance. 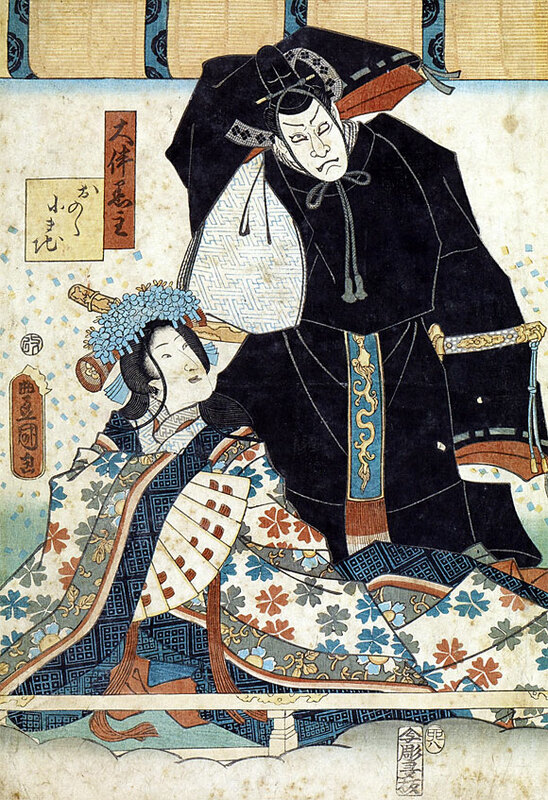 Ôtomo no Kuronushi is also depicted as a traitor scheming to seize control of Japan in the play "Seki no To", in which Henjô - under a former name of Munesada - and Komachi also appear. However, there is no known evidence to suggest that the real Kuronushi harboured any such ambitions, or that he was at all the evil character portrayed by the Kabuki.